Hi Carlo! First of all, for all the people that never heard about Solar Bankers before, can you give us an elevator pitch on what you guys are working on? Both developed and developing economies often face high cost barriers to extending the central electricity grid to remote or densely populated areas with difficult geography. The rise of localized intermittent renewables has also increased the need for modular distribution systems tailored specifically to local conditions. Especially in developing economies, these trends often leave substantial portions of the population with limited access to reliable and affordable energy. The UN has recognized this issue, making the access to clean and affordable electricity one of its key Sustainable Development Goals. Solar Bankers developed the first turnkey solution for peer-to-peer energy trading based on blockchain. By providing its proprietary solar technology, the micro-grid infrastructure and the blockchain integration, Solar Bankers offers the ultimate solution for off-grid electricity networks with the aim of helping developing countries expand rural electrification. Solar Bankers’ aim is to provide utilities and governments with a comprehensive package of basic applications containing everything they need to build micro grids in which households can produce and trade clean energy. Households will be supplied with Solar Bankers’ PV devices and connected via smart meters. The system uses the highly scalable Fiber blockchain platform to create a digital currency system for efficient and secure electricity trading. Solar Bankers Coin is the underlying currency that will be used to trade electricity among peers on the Solar Bankers Trading Platform. Before we go further into detail about Solar Bankers, I would like to start with a tribute to Alfred Jost, who founded Solar Bankers and passed away in November. Can you tell us a bit more about him and what he meant for Solar Bankers? Alfred was the soul of Solar Bankers and a paternal figure for all the young members of the team. He was passionate about his job and a true inspiration for all of us. His dream was to bring solar energy to the masses and we will do everything in our power to make his dream come true. Again, my condolences – Alfred will definitely be missed. The next question shall in no way sound rude/inappropriate, but since he was such a fundamental part of the team I have to ask: How does Solar Bankers go on without him? Who will be the new CEO? With Alfred’s passing, Solar Bankers lost an important team member. However, the fundamentals of the company haven’t changed and we are right on track to achieve our long-term goals. Alex Jost, Alfred’s son, was appointed as the new CEO and we wish Alex all the best in his new position. During this crypto bear market, a couple of projects ran out of funds or dumped their coins on the open market to further ensure funding. Solar Bankers is certainly not a hype project and has been around for several years. Nevertheless, investors might be interested to hear more about the funding of the project, so can you tell us a bit more about that? As you correctly stated, Solar Bankers was never a hype project. We were aware of the bubble going on in the crypto and blockchain market back in 2017 and thus we decided not to participate in the pump & dump party. We have been growing our company organically from its inception and we will continue to do so in the coming years. Surely the crypto bear market was tough, but we are confident that we will have the resources to continue our operations for the foreseeable future. It is great to see that Solar Bankers has several partnerships. One of these partnerships is with the Dubai Electricity and Water Authority, where you aimed to test your solar modules in a hot-temperature environment. How did these tests look like and what were the results? The results were better than expected. The combination of our holographic modules and azimuthal tracker allowed us to boost the performance by up to 60% when comparing to a standard fixed installation of the same nominal capacity. This is an outstanding result that shows the incredible potential of our technology. The Dubai Electricity and Water Authority is very satisfied with the results and we are currently exploring opportunities to expand our collaboration. Another partnership that was recently announced, was with the Turkish government. This partnership somehow stayed completely under the radar, even though the Turkish Ministry of Trade granted Solar Bankers a credit line of at least 60% of the total costs of their local manufacturing project. In my opinion, this is pretty huge. Can you tell us a bit more about this partnership? We have been working on this deal for more than a year in collaboration with our local consultant, the Alyaka group. On our last trip to Turkey, the Solar Bankers’ team presented the company’s manufacturing project in front of the Ministry of Trade in Ankara. 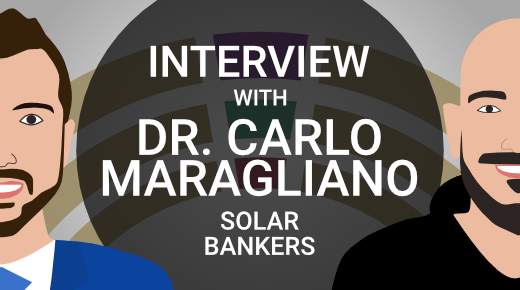 In this meeting Solar Bankers’ project was deemed eligible to receive an investment certificate, which will grant the company a credit line from state banks for a minimum of 60% of the total project cost. The Ministry of Trade showed particular interest towards Solar Bankers’ holographic modules. Given the current economic situation in Turkey, the government is incentivizing the manufacturing of goods that can be almost entirely (more than 75%) produced in the country. As Solar Bankers’ module uses only 25% of the cells compared to a standard module, its production can meet the indications of the Turkish state even when the solar cells are imported. The approval of the government has since then increased the exposure of Solar Bankers’ project in the Turkish country and attracted the interest of several investors. The third and last partnership I want to talk about in this interview is the pilot project in Nigeria, that you recently announced. How does this partnership look like? We are collaborating with the Kaduna State Power Supply Company (KAPSCO) on a test pilot of our system for P2P energy trading. Our agreement with KAPSCO envisions the connection of 66 commercial, governmental, and residential buildings covering an area of 150,000 square-meters in a local smart grid with energy trading capabilities. Our role is to supply the utility company with a full technology package containing all hardware and software components necessary to set up and run the smart grid. We will deliver smart grids through our Turkish technology partners at asay Energy, along with cabling and the blockchain-based database and energy trading platform. The project is significant because energy optimization in Africa can facilitate great advances in the sustainability of local energy generation, which is based on the use of Diesel generators. Which role does the SLB coin play in these partnerships and which use cases will it have in the future? How do you plan further distribution of SLB? The SLB coin will be used both as investment vehicle as well as a in-use coin to enable peer-to-peer energy trading on the blockchain. The distribution of SLB will take place over several OTC or public sale rounds throughout a long period of time (probably more than 10 years). The SLB coin runs on its own blockchain. You came up with the pretty innovative concept of a blockchain, that is solely powered by renewable energy. The concept will be realised with so-called “solar nodes”. Can you tell us more about them? Our Solar Nodes represent the first blockchain nodes run solely on solar energy. Our design combines a small-scale PV module with a Raspberry Pi and a power storage unit. The Raspberry Pi is programmed to run as a node in our Fiber-based blockchain network. For each unit of time that users run the node, they receive a certain amount of SLB. Users will gain access to their personal account on the Solar Bankers website, where they can monitor the amount of SLB coins they accumulated. We hope to further develop the solution to be able to power a Skyminer. As we saw, Solar Bankers has lots of stuff going on. What have you guys planned for 2019? Which parts of the project have the highest priority and how does an approximate roadmap look like? Completing and managing our test pilot with KAPSCO will be a major priority for us. It will allow us to optimize our blockchain solutions for the energy sector and get the first customer feedback on our applications. We also hope to develop a demand response algorithm to automate trading on the network and optimize power distribution. Solar Bankers will also push ahead with commercialising its solar technology based on the results of our test pilot with DEWA. Awesome news! Thank you for doing this interview, Carlo!